Separators are used to separate magnetic materials, such as magnetic beads, from the non-magnetic medium in a vessel. The magnetic separator unit pulls the magnetic beads and holds them using magnetic forces allowing the medium to be removed. 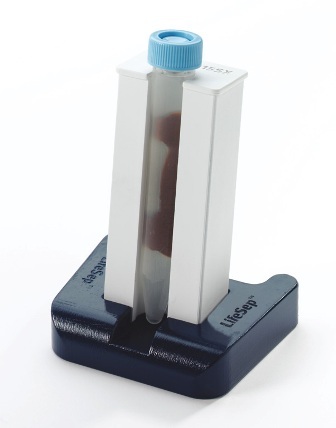 Dexter’s LifeSep® magnetic separators provide an immediate starting point for performing rapid separations in single tubes/vessels as well as microtitre plates. Select from one of our patented standard separators or personally work with our team of design engineers to create a custom separator product to fit your needs. Dexter offers standard vessel and tray magnetic bead separation and custom solutions. If you are involved in the design of clinical diagnostic equipment or automated high-throughput applications that rely on biomagnetic bead processing for improving productivity in biotechnology and life science research, Dexter will provide you with results. Learn more about our magnetic separators for medical solutions.